Last time we talked about sculpting your tone, we spoke on pots (potentiometers), caps (capacitors), and some simple mods. This time we are going to tackle 50's Vs. Modern wiring and why you might want one over the other. 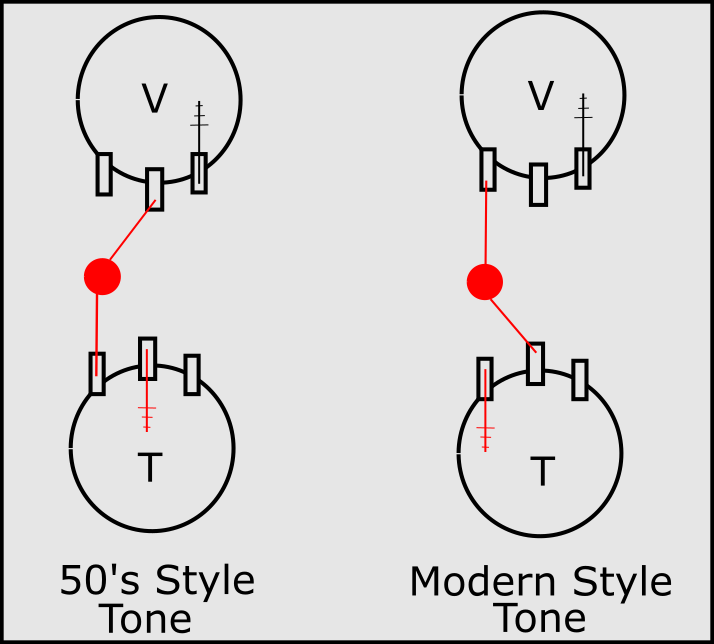 We will be discussing the relationship of the tone pots to the volume pots and how this impacts the overall feel and tone of your electric guitar. Just remember to take a picture of your wiring before you start changing things around, just in case! 50's style wiring will yield less treble loss but with a bit of volume drop as you roll off the tone. This type of wiring can be helpful if you prefer a more traditional style. It also may be a solution if your guitar seems a little dark. With modern style there is a bit of treble loss, but the volume is more consistent as you roll down the tone knob. While this may seem less appealing, it can help tame a bright guitar a bit and keeps that volume stable. Which you prefer is up to you, but it is a relatively simple experiment and may be worthwhile! All that really changes is where the ground is on the tone pot and where the cap is soldered to the tone and volume pots. Treble bleeds are another way to combat a darker guitar, but really are only applicable as you turn the volume knob down. The above wiring is more about the full volume operation. More on that later!